Request 1 or more style by number here. 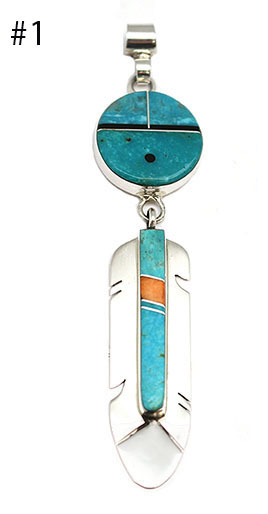 This sterling silver sunface pendant is inlaid with turquoise and jet and has a feather dangling that is also inlaid with turquoise and spiny oyster hi-lite. It measures approximately 3 1/4" long including bail by just under 3/4" wide. Handmade by Zuni artisan Fredrick Yazzie. 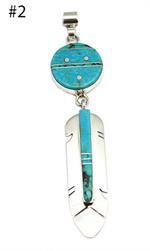 Also available in all turquoise. Choose style by number when ordering.